4864. Ferne Priscilla YOST [scrapbook] 1, 2 (George J YOST , George O YOST , Dianna BITLER , Mark , John , Johannes ) was born on 10 Sep 1924 in PA. She died in Jan 1988. 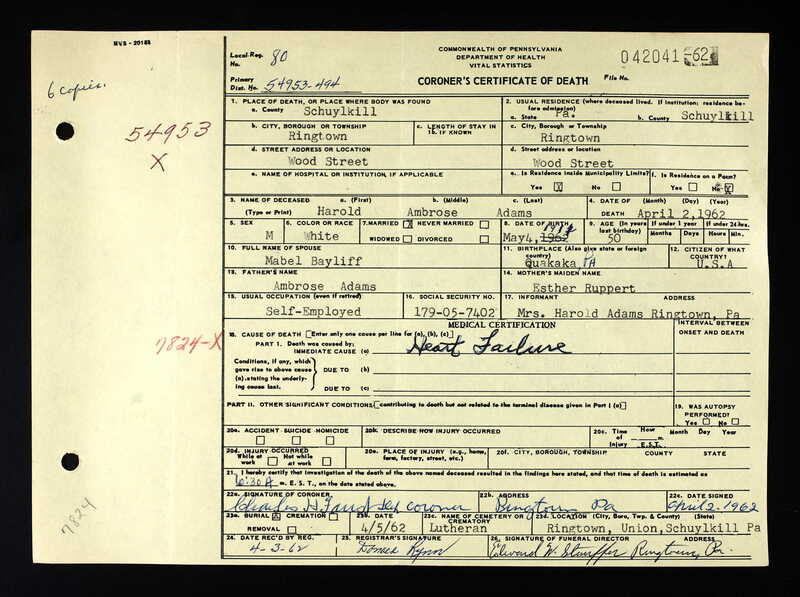 Ferne resided in 1940 in Park Crest Pond, Ryan Twp, Schuylkill Co, PA. She resided in 1947 in Barnesville, Schuylkill Co, PA. She was issued a social security number before 1951 in PAcific Beach, CA. She resided in Jul 1953 in 2001 Kennsington Ave, Harrisburg, Dauphin Co, PA. She resided in Jun 1955 in 62 W Center St, Nesquehoning, Carbon Co, PA. She resided in 1975 in Bethlehem, Northampton Co, PA. She resided in Feb 1977 in Bethlehem, Northampton Co, PA.
Ferne married Charles Francis MCBRIDE on 4 Aug 1943 in Luzerne Co, PA.
Ferne also married Julius SMULLIGAN about 7 Jan 1947 in Schuylkill Co, PA.
9468 M i [Male] SMULLIGAN. Ferne also married Bernard Anthony KRAJCIR Sr [scrapbook] 1, son of Stephan KRAJCIR and Anna OSLAK, about 1947 in Schuylkill Co, PA. Bernard was born on 10 Jan 1925 in Hauto, Carbon Co, PA. He died on 21 May 1993 in Leader Nursing And Rehabilitation Center II, Bethlehem, Northampton Co, PA. He was buried on 25 May 1993 in Egypt Cemetery, Egypt, Lehigh Co, PA. He was also know as Bernard Anthony Krijcher. He resided in 1940 in RD 1 Mauch Chunk, Carbon Co, PA. 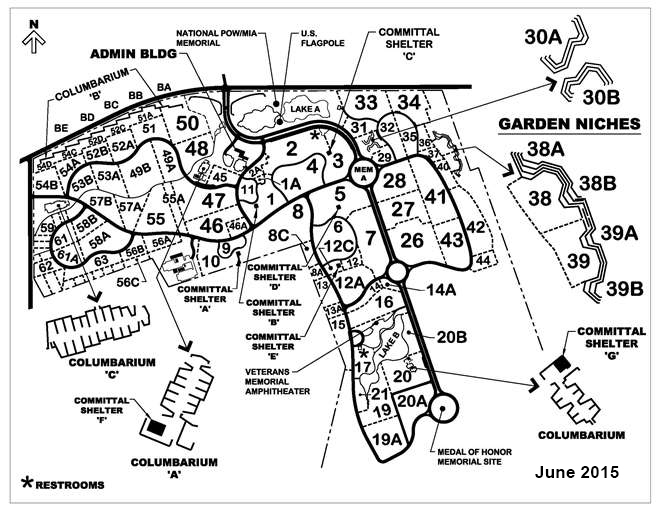 He served in the military with U.S. Navy - CM 3C from 8 Jan 1943 to 18 Mar 1946 in WW II. He was issued a social security number before 1951 in PA. He resided in Feb 1977 in Egypt, Lehigh Co, PA.
9469 M ii Bernard A KRAJCIR Jr.
4867. Phyllis C YOST (George J YOST , George O YOST , Dianna BITLER , Mark , John , Johannes ). Phyllis married Jesse H WEBB. 9470 M i [Male] WEBB. 4868. 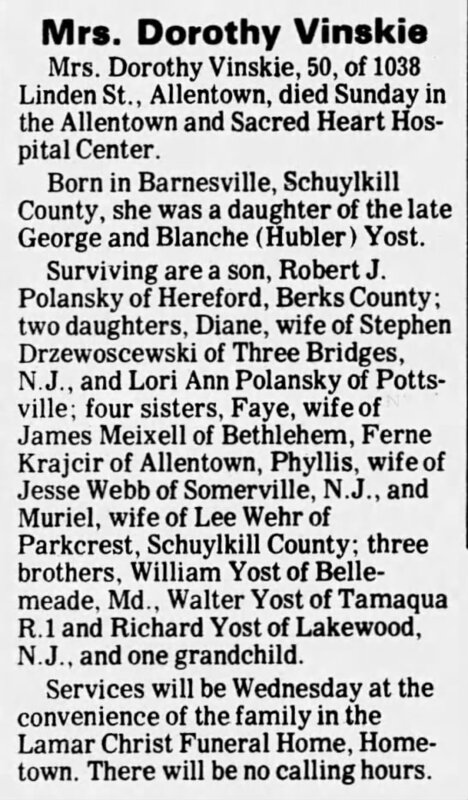 Dorothy A YOST [scrapbook] 1, 2, 3 (George J YOST , George O YOST , Dianna BITLER , Mark , John , Johannes ) was born in 1931 in Barnesville, Schuylkill Co, PA. She died on 2 May 1982 in Sacred Heart Hospital Center, Allentown, Lehigh Co, PA. She was buried in White Church Cemetery, Rush Twp, Schuylkill Co, PA.
Dorothy resided in 1940 in Park Crest Pond, Ryan Twp, Schuylkill Co, PA. She resided in Nov 1949 in Allentown, Lehigh Co, PA. She resided in 1975 in Frackville, Schuylkill Co, PA.
Dorothy married Thomas E POLANSKY in 1951/1969 in Schuylkill Co, PA. Thomas died on 17 Aug 1991. 9471 M i Robert J POLANSKY. 9472 F ii Diane POLANSKY. 9473 F iii Lori Anne POLANSKY. Dorothy also married [Male] VINSKIE before 1975. 4869. Muriel E YOST (George J YOST , George O YOST , Dianna BITLER , Mark , John , Johannes ). Muriel married Leroi A WEHR [scrapbook], son of Hiram WEHR and Ruth YOST. Leroi was born on 6 Dec 1931 in Shenandoah, Schuylkill Co, PA. He died on 4 Jun 1987 in Barnesville, Schuylkill Co, PA. 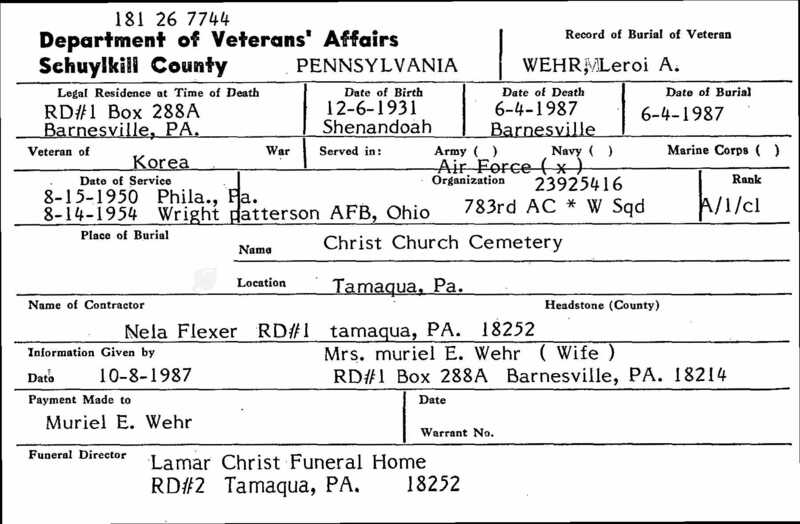 He was buried on 9 Jun 1987 in White Church Cemetery, Rush Twp, Schuylkill Co, PA.
Leroi served in the military with U.S. Air Force - Corporal - 783rd AC * W Sqd from 15 Aug 1950 to 14 Aug 1954 in Korean War. He resides in 1952 in San Antonio, Bexar Co, TX. He resides in 1987 in Barnesville, Schuylkill Co, PA. He worked as police chief (15 yrs) in Ryan Twp, Schuylkill Co, PA. He worked as Chief with Ryan Township Volunteer Fire Company. He worked as inspector with Mack Truck Inc. He is a member of Bethany United Methodist Church in Barnesville, Schuylkill Co, PA.
9474 M i Lee Allen WEHR. 9475 F ii Colleen M WEHR. Colleen married Andrew B ZELONIS. 9476 M iii Jack R WEHR. 4870. Walter YOST 1, 2, 3 (George J YOST , George O YOST , Dianna BITLER , Mark , John , Johannes ) was born on 8 Dec 1934 in Barnesville, Schuylkill Co, PA. He died on 1 Jan 2011 in Pottsville, Schuylkill Co, PA. He was buried in Christ Church Cemetery, McKeansburg, Schuylkill Co, PA.
Walter resided in 1940 in Park Crest Pond, Ryan Twp, Schuylkill Co, PA. He resided in 1975 in RD 1 Tamaqua, Schuylkill Co, PA. He resided in 1991 in New Ringgold, East Brunswick Twp, Schuylkill Co, PA.
Walter married Marguerite MENGEL 1 about 1981. Marguerite was born on 27 May 1926. She died on 6 Mar 2012. Marguerite resided in 2011 in Orwigsburg, Schuylkill Co, PA.
9477 F i Sheryl YOST. 9478 M ii Thomas G "Tom" YOST. 4872. Mabel Ester RUPERT 1, 2, 3, 4, 5 (Fredrick Sylvester RUPERT , Hannah Elizabeth DODSON , Caroline BITLER , Mark , John , Johannes ) was born on 24 May 1903 in PA. She died in Nov 1982. Mabel resided in 1910 in Union Twp, Schuylkill Co, PA. She resided in 1920 in Suscon Village, PIttston Twp, Luzerne Co, PA. She resided in 1930 in Exeter Twp, Luzerne Co, PA. She resided in 1940 in Exeter Twp, Luzerne Co, PA. She was issued a social security number in 1952/1953 in PA.
Mabel married J Wesley HUTHMAKER "Wesley" 1, 2, 3, 4, son of James R HUTHMAKER and Cora ROBERTSON. Wesley was born on 24 Apr 1903 in Wyoming Co, PA. He died on 10 Apr 1991. Wesley resided in 1920 in Wyoming, Luzerne Co, PA. 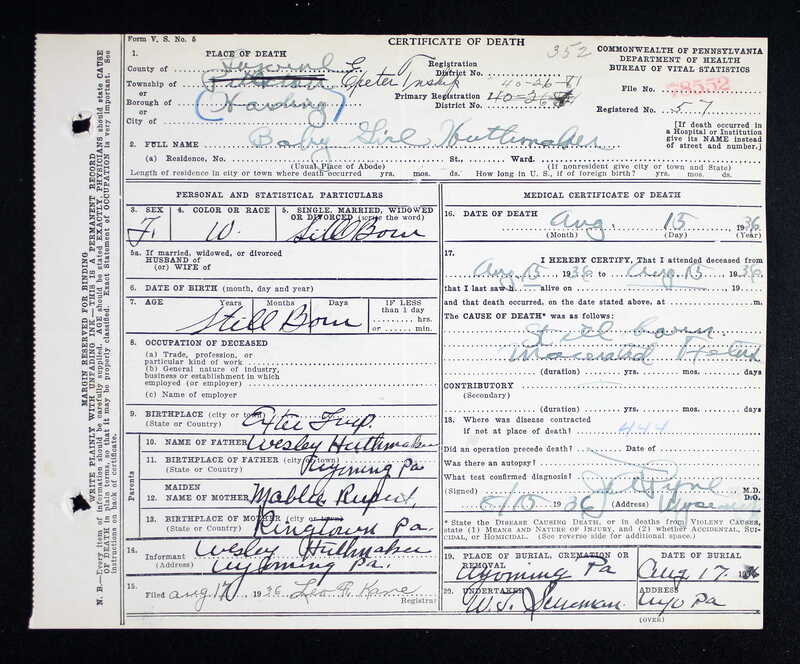 He resided in 1930 in Exeter Twp, Luzerne Co, PA. He worked as chemist - power plant in 1930. He resided in 1940 in Exeter Twp, Luzerne Co, PA. He worked as chemist - generating electricity in 1940. He was issued a social security number before 1951 in PA.
9479 F i Serda HUTHMAKER. + 9480 M ii Frederick James HUTHMAKER was born on 26 Nov 1933. He died on 15 Oct 1991. Baby Girl HUTHMAKER [scrapbook] was born on 15 Aug 1936 in Exeter Twp, Luzerne Co, PA. She died on 15 Aug 1936 in Harding, Exeter Twp, Luzerne Co, PA. She was buried on 17 Aug 1936 in Wyoming, Luzerne Co, PA.
4876. Marian Pauline RUPERT [scrapbook] 1, 2, 3, 4, 5 (Fredrick Sylvester RUPERT , Hannah Elizabeth DODSON , Caroline BITLER , Mark , John , Johannes ) was born on 26 Feb 1918 in Suscon, Pittston Twp, Luzerne Co, PA. She died on 13 Dec 2007 in WIlkes-Barre General Hospiotal, Wilkes-Barre, Luzerne Co, PA. She was buried in Fairview Memorial Park, Moscow, Lackawanna Co, PA.
Marian resided in 1920 in Suscon Village, PIttston Twp, Luzerne Co, PA. She resided in 1930 in 413 Beat Rd, PIttston Twp, Luzerne Co, PA. She graduated from Pittston High School. She resided in 1940 in Bear Creek Rd, Pittston Twp, Luzerne Co, PA. She worked as waitress - restaurant in 1940. She worked with Atlas Powder Company in Suscon, Luzerne Co, PA. She worked as co-owner/operator with Shoener's Grocery Store in Scranton, Lackawana Co, PA. She was a member of St. Peter's Lutheran Church in Scranton, PA. She resided in 2007 in Suscon Rd, Pittston Twp, Luzerne Co, PA.
9482 M i Joseph J ZARANICK Jr.
9483 M ii Allen T ZARANICK. 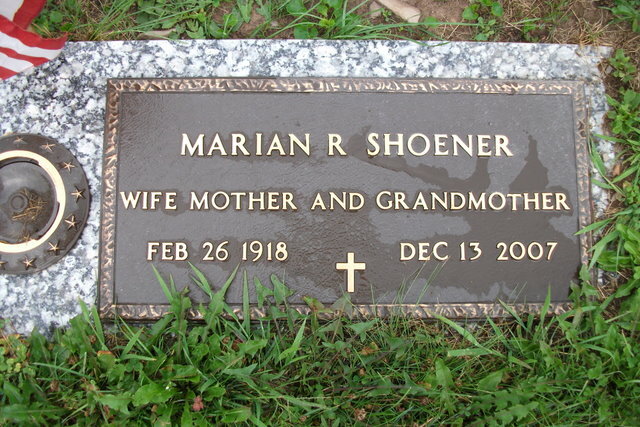 Marian also married Elmer H SHOENER [scrapbook] 1, 2, 3, 4, son of Frankline Monroe SHOENER and Carrie P BIESECKER. Elmer was born on 14 Dec 1910 in PA. He died on 17 Jun 1975 in Scranton, Lackawana Co, PA. 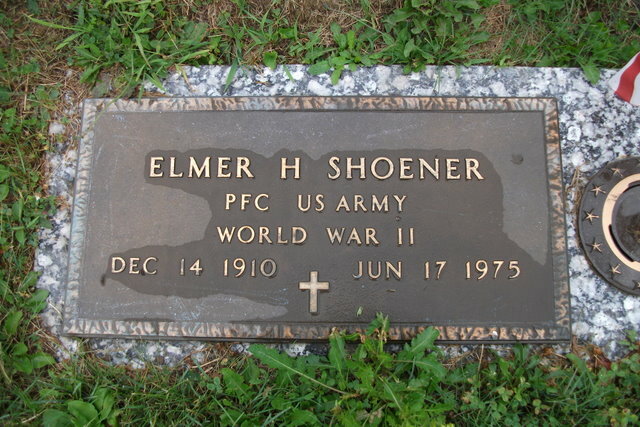 He was buried in Fairview Memorial Park, Moscow, Lackawanna Co, PA.
Elmer served in the military with U.S. Army - PFC from 13 Nov 1942 to 7 Nov 1945 in WW II. He was issued a social security number . 9484 M iii Carl D SHOENER. 9485 M iv Gary H SHOENER. 4878. Walter Samuel FAUST (Clara Caroline RUPERT , Hannah Elizabeth DODSON , Caroline BITLER , Mark , John , Johannes ) was born on 1 Sep 1902. He died on 1 Nov 1945. He was buried in St John's Cemetery, Ringtown, Schuylkill Co, PA.
9486 M i Robert FAUST. 9487 F ii Evelyn FAUST. 9488 M iii Henry FAUST. 4888. Alvin Sylvester ADAMS (Esther Elizabeth RUPERT , Hannah Elizabeth DODSON , Caroline BITLER , Mark , John , Johannes ) was born on 22 Jul 1909 in Quakake, Schuylkill Co, PA. He died on 9 May 1965 in Ringtown, Schuylkill Co, PA. He was buried in St Paul's (Old White Church), Ringtown, Schuylkill Co, PA.
Alvin resided in 1930 in W Main St, Ringtown, Schuylkill Co, PA. He worked as clerk - railroad in 1930. He resided in 1940 in PA Rt 42, Ringtown, Schuylkill Co, PA. He worked as machinist - garage in 1940. Alvin married Sara Rae BEAVER, daughter of Bert Clarence BEAVER and Iva Annette WAGNER. Sara was born on 24 Oct 1913. She died on 18 Feb 2006. She was buried in St. Paul's (Old White Church) Church, Ringtown, Schuylkill Co, PA.
Sara resided in 1940 in PA Rt 42, Ringtown, Schuylkill Co, PA.
Thomas Arnold ADAMS [scrapbook] was born on 10 Feb 1934 in PA. He died on 25 Feb 1991 in Riverside, Riverside Co, CA. He was buried in Sec 41 Site 146, Riverside National Cemetery, Riverside, Riverside Co, CA. Thomas resided in 1940 in PA Rt 42, Ringtown, Schuylkill Co, PA. He served in the military with U.S. Air Force - SMSGT in Korea, Vietnam. 9490 F ii Janice M ADAMS. Janice married Thomas W HOFFMAN. 4889. Harold Ambrose ADAMS [scrapbook] (Esther Elizabeth RUPERT , Hannah Elizabeth DODSON , Caroline BITLER , Mark , John , Johannes ) was born on 4 May 1911 in Quakake, Schuylkill Co, PA. He died on 2 Apr 1962 in Ringtown, Schuylkill Co, PA. He was buried in St. John's Cemetery, Ringtown, Schuylkill Co, PA.
Harold resided in 1930 in W Main St, Ringtown, Schuylkill Co, PA. He worked as laborer - ice company in 1930. He resided in 1940 in Ringtown, Schuylkill Co, PA. He worked as truck driver in 1940. Harold married Mabel BAYLIFF. Mabel was born on 10 Dec 1910. She died on 27 Sep 1978 in Fairfax, Fairfax Co, VA.
Mabel resided in 1940 in Ringtown, Schuylkill Co, PA.
Donna Mae ADAMS was born on 22 Sep 1943. She died on 24 Dec 1972. 4892. Rev. Warren Emerson ADAMS (Esther Elizabeth RUPERT , Hannah Elizabeth DODSON , Caroline BITLER , Mark , John , Johannes ) was born on 9 Oct 1917 in Schuylkill Co, PA. He died on 15 Nov 1976 in Strausstown, Upper Tulpehocken Twp, Berks Co, PA.
Warren resided in 1930 in W Main St, Ringtown, Schuylkill Co, PA.
Warren married Edythe D DAVIS. 9492 F i Louise A ADAMS. 9493 F ii Jane A ADAMS. 4895. 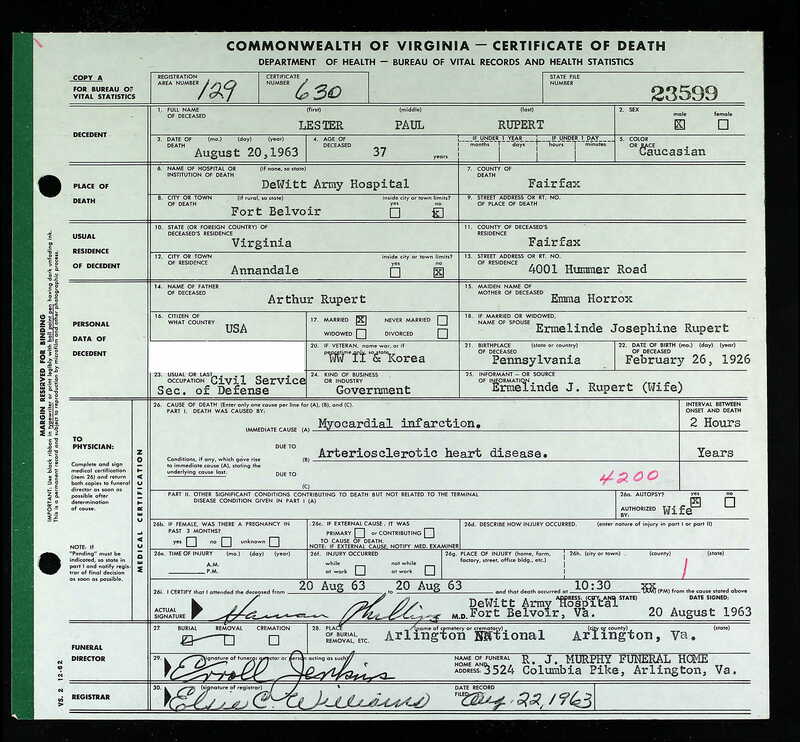 Lester Paul RUPERT [scrapbook] 1 (Arthur Lester RUPERT , Hannah Elizabeth DODSON , Caroline BITLER , Mark , John , Johannes ) was born on 26 Feb 1926 in Ringtown, Schuylkill Co, PA. He died on 20 Aug 1963 in DeWitt Army Hospital, Fort Belvoir, Fairfax Co, VA. He was buried on 23 Aug 1963 in Sec 43 Site 5511, Arlington Natioanl Cemetery, Arlington, VA.
Lester resided in 1930 in W Main St, Ringtown, Schuylkill Co, PA. He served in the military with U.S. Armmy - Sergeant in WWII, Korea. He resided in 1963 in 4001 Hummer Rd, Annondale, Fairfax Co, VA.
Lester married Ermelinde Josephine SEDNICKA on 21 Sep 1952 in Linz, Austria. + 9494 F i Irene RUPERT. + 9495 F ii Renee Emma RUPERT.